When it comes to care and maintenance of pool systems, it is safe to say that it doesn’t get any better than self-cleaning salt water chlorinators. These handy chlorination systems combine the benefits of salt water chlorination with automated systems. That way, you get a super clean and sanitary pool without chlorine odor or irritation and with as little maintenance practice as possible. With all this to offer, it is no wonder that self-cleaning chlorinators are all the rage these days. 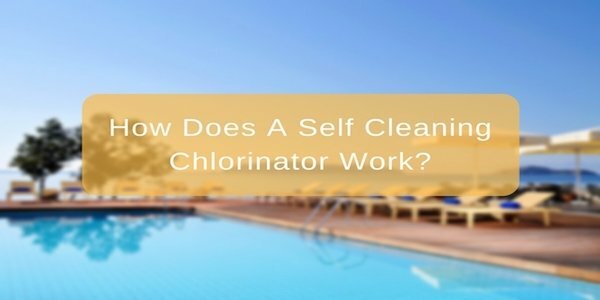 So, how does a self cleaning saltwater chlorinator work and what is it that makes them such a good option when looking for pool sanitization systems? As the name suggests, a self cleaning salt water chlorinator is a chlorination system equipped with mechanisms that do the cleaning of the chlorinator cell and prevent accumulation of potentially disabling materials like calcium residue. In order to understand how these systems work, it is important to first understand how the mineral deposition works. Calcium exists in the water as a positively charged ion. Therefore, it is naturally attracted to the negative electrode plates within ordinary salt water chlorinator cells. Over time, calcium accumulates to a point where the electrode is rendered useless and the cell needs to be cleaned. A self cleaning salt water chlorinator works by using a process known as reverse polarity. It all happens down at the chlorinator cell and this is where the electrodes can either be positive or negative based on signals from a controller. The control unit will regularly change the polarity charge preventing accumulation of the calcium and other minerals like it. That way, you don’t have to keep removing and cleaning the cell in order to ensure functionality. This is a very simplistic description of how does a self cleaning saltwater chlorinate work – think of it as chemistry. It is easy to use – in older models all you have to do is set the reversal interval, however modern day units have this pre-set at an interval that is optimal for the chlorinator cell. It is highly effective in ensuring no buildup of minerals on the cell’s charged plates. It is a low maintenance unit. It saves you a lot of money that you would have required to replace or repair damaged salt water cells. It allows you to enjoy the benefits of ordinary salt water chlorinators without the extra hassle. These include efficient water chlorination, odorless water and elimination of irritating effects of chlorine. Self-cleaning salt water chlorinators may be pretty awesome as far as the maintenance part goes but this doesn’t mean that there is nothing you need to do to take care of them. It is advised to check the cell for deposits at least once every 4 or 5 months. If by some unlikely chance you find deposits on the charged plates, all you need to do is to follow the general salt cell cleaning guidelines to have your unit functioning optimally. For more information, read our article on cleaning a cell with muriatic acid. After all is said and done, there is no denying the fact that self-cleaning salt water chlorinator cells are pretty cool. The simple mechanism makes the world of a difference allowing you to enjoy your chlorination system for a very long time and now you know how does a self cleaning saltwater chlorinator work. The fact that it saves you on maintenance and repair fees means you get to save an extra penny or two. Having understood how it works and how to take care of such a system, it is safe to say that you have all the information you need to make an informed decision. Therefore whether it is your new pool or you are looking for a replacement for your spa system, you can rest assured that you cannot go wrong with self-cleaning salt water chlorinators.